This morning you probably received dozens of marketing emails from various companies. How many of them were actually relevant to your current needs? And how many of them did you simply “mark as read” or delete without even opening? We are so bombarded by marketing messages that we tune out the vast majority of them just so we can get through the day. As a marketer, this means you have to be smarter about the ways you engage customers. Perhaps the most effective way to cut through this noise is to simply provide relevant messages based on a customer’s needs and behavior. Or, in other words, personalize your marketing. The foundation of good marketing is getting the right message to the right customer at the right time. This is exactly what personalization does. Personalization coupled with SMS is a particularly powerful strategy because SMS is much more likely to be read than email. Think back to those emails you received this morning. Now think about how many SMS messages you received and how many you opened. I’m going to go ahead and guess you only received a few and you read every single one of them. Now, if a company sent you an SMS that was not relevant, you would likely read it, but you would also find it annoying and spammy. SMS often requires companies to be even more selective about what they send to customers so that customers don’t feel their space is being invaded. This is where personalization comes in. By tracking user behavior, and subsequently using it to target messages, you ensure that your SMS messages will be welcomed by the customer. Personalization starts with data. You need a comprehensive data set that you will use to drive targeted messages. 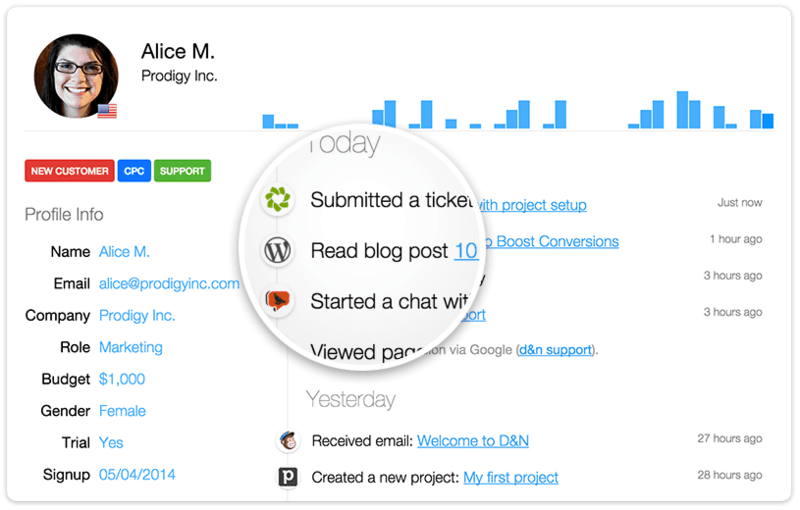 This means capturing and unifying customer activity across channels such as email interactions, app engagement, support activity, and more. Track – You begin by tracking customer activity across channels so that you have a complete and comprehensive data set to use as the foundation of your targeting. If your data set is not comprehensive, you risk sending customers irrelevant messages because you failed to understand the full context of their behavior. 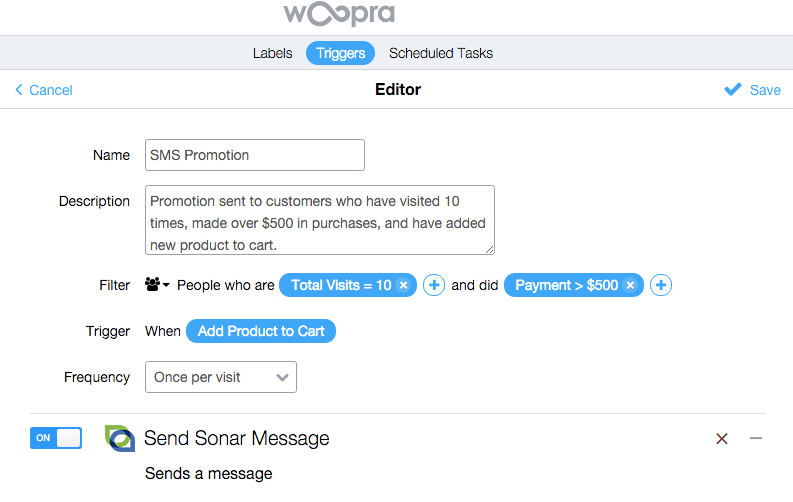 Target – Now that your segments are in place, you can target relevant messages to those segments. For example, you may want to send a satisfaction survey to the segment of “customers who have submitted a support request within the last week and have previously purchased at least $1,000” as they are high spenders who may be currently dissatisfied with your service. Let’s take a look at two specific examples of how you can combine data and SMS to improve the customer journey. Offering customers promotions can be a powerful sales tool, but the timing of a promotion is often just as important as the offer itself. One of the most effective times to offer a customer a promotion is in the exact moment when they are most likely to buy. In this moment, the customer is likely debating whether or not to pull the trigger. They are running all the pros and cons in their head, seeing if there is a reason they shouldn’t purchase. By incentivizing the customer with a promotion in that moment, you make the decision easier for them by providing just enough of a push to convince them to commit to the purchase. All of these behaviors, and many others, indicate that a customer is strongly considering a purchase. Capitalize on the moment by sending them a relevant offer via SMS. For example, if a customer has viewed a product listing for a laptop five times over the last week, but has yet to purchase, an offer for $50 off the laptop could be enough incentive for them to finally buy. All of these reasons indicate at least a small intention to buy. This intention can be nurtured with a targeted offer sent directly to the customer via SMS, where they are more likely to read it than if it were sent via email. For example, if a customer has added a t-shirt and a pair of jeans to their cart and then abandoned it, an offer for $10% off if the customer purchases both items may be just the extra nudge they need to complete the purchase. 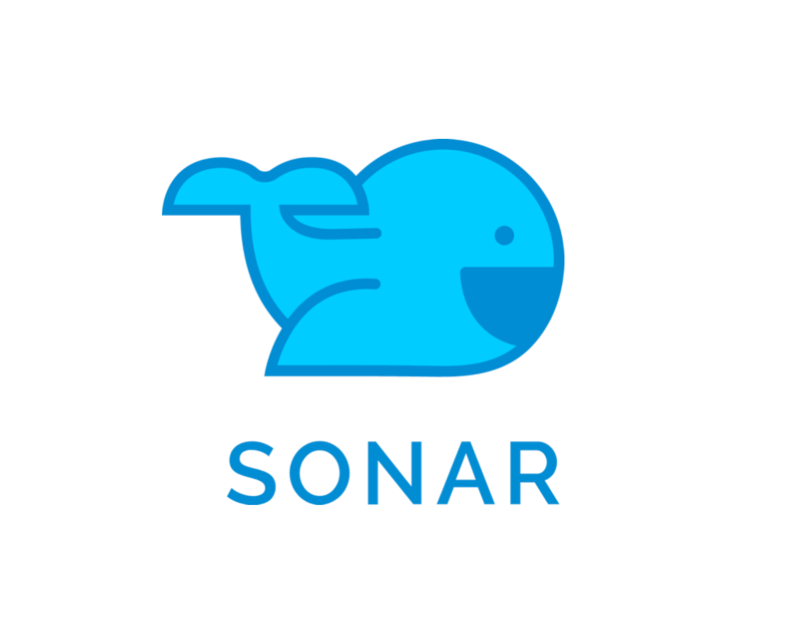 Woopra and Sonar have teamed up to make it simple for companies to personalize SMS. With our code-free integration, you can start targeting SMS messages so that they are always relevant to and welcomed by your customers. Create a free account to learn more about the integration and get in touch with any questions. Natalie Issa is a marketing director at Woopra, a real-time customer analytics service, where she spends most of her time exploring the ways data can improve customer experience. Follow her on twitter at @natissa.